WRIGHT-PATTERSON AIR FORCE BASE — Janet Wolfenbarger has a career full of firsts. The 1976 graduate of Beavercreek High School was among the first female graduates of the U.S. Air Force Academy in 1980. She became the first female four-star general — and highest ranking female — in the Air Force in 2012 and in the same year became the first female commander of Air Force Materiel Command. On Monday in front of 750 people in Kenney Hall at the Air Force Institute of Technology, Wolfenbarger was part of another first. She became the first female four-star general to turn an Air Force command over to another female four-star general when General Ellen Pawlikowski took command of AFMC. Wolfenbarger began as a second lieutenant in 1980 and nine promotions later achieved her current status. The 35-year veteran held a variety of assignments at Electronic Security Command and Air Force Systems Command and worked on arguably the three most important weapon systems — the B-2, F-22 and C-17. In leading AFMC — which conducts research, development, test and evaluation and provides acquisition management services and logistics support to keep Air Force weapons ready for war — she was in charge of 80,000 people on eight bases and managed an annual budget of $60 million. Wolfenbarger presided over that reorganization that included the consolidation of 12 centers into five, while cutting overhead costs and redundant layers of staff, resulting in savings equal to $109 million annually. The moves also improved AFMC’s overall management and lines of communication. 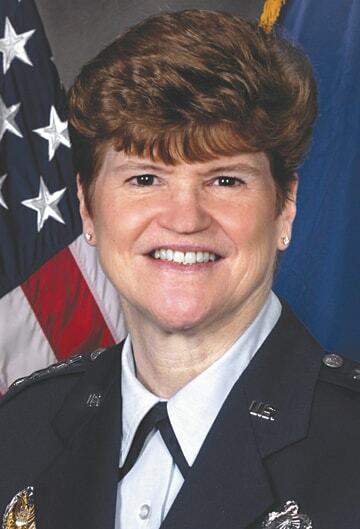 Prior to coming to WPAFB for her ninth different assignment, Wolfenbarger was the military deputy in the Office of the Assistant Secretary of the Air Force for Acquisition at the Pentagon. She was vice-commander of AFMC from December 2009 to September 2011 and was director of Intelligence and Requirements Directorate at AFMC before that.